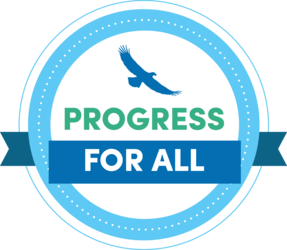 Progress For All is dedicated to building our grassroots movement for progressive reform. As Gandhi said, “the means are the ends in the making.” We don’t just advocate for campaign finance reform. We practice what we preach by accepting only small donations, and not a penny from any corporations and their PACs. We support election justice and integrity reforms to renew our democracy, criminal justice reform and ending the misguided war on drugs, rebuilding our economy from the bottom up, and protecting our environment by addressing climate change and converting to alternative sustainable energy. Progress For All relies on people like you and thousands of small donations for all of our funding. That’s why you can count on us always to stand up for you and your communities against predatory corporate interests. Your donation will help make a difference. Please make a contribution to Progress For All today. You may receive updates from Progress For All, the sponsor of this fundraiser. 1. I am a U.S. citizen or lawfully admitted permanent resident (i.e., green card holder). another person or entity for the purpose of making this contribution. business credit card or a card issued to another person. 4. I am at least eighteen years old. 5. I am not a federal contractor.